Arguably all black communities are dysfunctional and African diaspora communities in prosperous western nations are not exempt. Some scholars have attributed Africans and its diasporas' woes to genetic inferiority. Many argue that Africans' problems are caused by their failure to adopt western democracy and to build strong institutions. This book demonstrates that issues such as the absence of strong institutions and bad leadership are not the root causes of Africa's miseries but are symptoms of more fundamental problems. Using empirical and qualitative studies, this book highlights the six root causes of the unending plight of Africa and its diasporas. It shows that the plight of Africans and African diasporas are interwoven, hence it addresses them concurrently. Femi Akomolafe brings to the fore his invaluable insights as an African who has lived in the UK diaspora for more than a decade in this book. 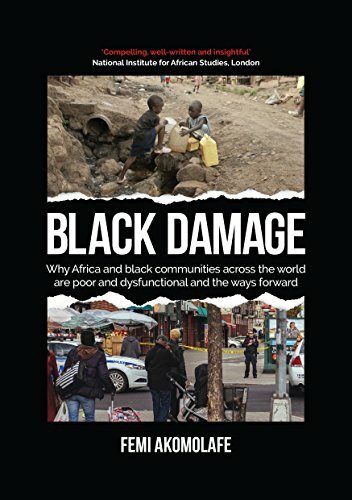 Black Damage rests on the premise that the black race is damaged.